This is a long-awaited and needed book about the mutual relationship between moral theology and spirituality -- in the past, at the present time, and with hope for the future. It is a gentle and convincing book, both in its tone and in its arguments. It is in the best sense a scientific book and at the same time an existential text. It appeals to mind and heart. This is a most useful book for every Christian striving to become ever more a discerning person, aiming at integration of prayer and life. Books like this strengthen my unbroken optimism about the ongoing renewal of Christian ethics and Christian spirituality."" Bernhard Haering, Gars, Germany In 'Becoming Good, Becoming Holy', Mark O'Keefe makes a valuable contribution to our understanding of the Christian life in its wholeness and integrity. By connecting love and justice; prayer, discernment, and moral decision making; fundamental option and spiritual growth, he challenges unhelpful divisions between Christian ethics and spirituality. His vision of conversion and of the Christian life as a dynamic totality will appeal to a wide range of readers."" 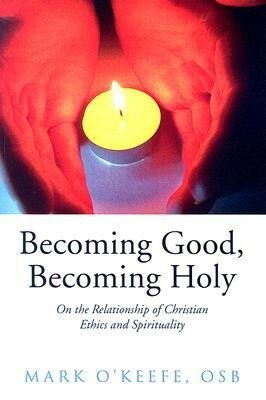 Elizabeth Dreyer, Washington Theological Union Clearly written and insightful, 'Becoming Good, Becoming Holy' is a convincing response to the Second Vatican Council's call to renew Catholic moral theology by centering it on our life in Christ. Best of all, O'Keefe underscores both the pivotal connection between Eucharist and morality, and the integral role of prayer and discernment in Christian moral decision making."" Paul Wadell, Catholic Theological Union Mark O'Keefe, OSB, is Associate Professor of Moral Theology at St. Meinrad School of Theology and a Benedictine monk at St. Meinrad Archabbey. He is the author of 'What Are They Saying About Social Sin?' and his articles have appeared in 'New Theology Review', 'Irish Theological Quarterly', 'New Blackfriars', 'Eglise et Theologie', and other theological journals. I'm the author/artist and I want to review Becoming Good, Becoming Holy.